A draugr (original Old Norse plural draugar) literally "after-walker" or "one who walks after death" is an undead creature from Norse mythology, a subset of Germanic mythology. The original Norse meaning of the word is ghost, and older literature makes clear distinctions between sea-draug and land-draug. Draugar were believed to live in the graves of the dead, with a draugr being the animated body of the dead. As the graves of important men often contained a good amount of wealth, the graugr jealously guards his teasures, even after death. Also known as, draug (Icelandic),dreygur (Faroese), or draugen (Norwegian, Swedish and Danish, meaning "the draug"). Draugar possess superhuman strength, can increase their size at will, and carry the unmistakable stench of decay. They are undead Vikings that retain some semblance of intelligence, and who delight in the suffering that they cause. The draugr's ability to increase its size also increased its weight, and the body of the draugr was described as being extremely heavy. Thorolf of Eyrbyggja Saga was "uncorrupted, and with an ugly look about him... swollen to the size of an ox," and his body was so heavy that it could not be raised without levers. They are also noted for the ability to rise from the grave as wisps of smoke and "swim" through solid rock, which would be useful as a means of exiting their graves. In folklore the draugar slay their victims through various methods including crushing them with their enlarged forms, devouring their flesh, devouring them whole in their enlarged forms, indirectly killing them by driving them mad, and drinking their blood. Animals feeding near the grave of a draugr may be driven mad by the creature's influence. They may also die from being driven mad. Thorolf, for example, caused birds that flew over his howe to drop dead. Draugr are also noted as being able to drive living people insane. ... the oxen which had been used to haul Thorolf's body were ridden to death by demons, and every single beast that came near his grave went raving mad and howled itself to death. The shepherd at Hvamm often came racing home with Thorolf after him. One day that Fall neither sheep nor shepherd came back to the farm. The creation of a draugr is not exactly clear, but in the Eyrbyggja saga, a shepherd is killed by a draugr and rises the next night as one himself. The draugr is also often shown as haunting its living family. Some draugar are immune to weapons, and only a hero has the strength and courage needed to stand up to so formidable an opponent. In legends the hero would often have to wrestle the draugr back to his grave, thereby defeating him, since weapons would do no good. A good example of this kind of fight is found in the Hrómundar saga Gripssonar. Although iron could injure a draugr, as is the case with many supernatural creatures, it would not be sufficient to stop it. Sometimes the hero is required to dispose of the body in unconventional ways. The preferred method is to cut off the draugr's head, burn the body, and dump the ashes in the sea; the emphasis being on making absolutely sure the draugr was dead and gone. The draugar were said to be either hel-blár ("blue-death") or, conversely, nár-fölr ("corpse-pale"). The "blue-death" color was not actually achromatic but was a dark blue or maroon hue that covered the entire body. 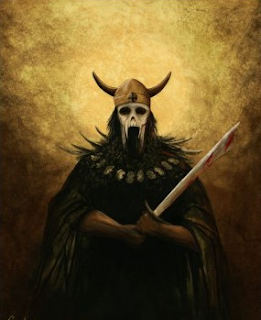 Glámr, the undead shepherd of the Grettis saga, was reported to be dark blue in color and in Laxdœla saga the bones of a dead sorceress who had appeared in dreams were dug up and found to be "blue and evil looking." My howe shall stand beside the firth. And there shall be but a short distance between mine and Thorsteinn's, for it is well that we should call to one another. During the first night, Aran got up from his chair and killed the hawk and hound and ate them. On the second night he got up again from his chair, and killed the horse and tore it into pieces; then he took great bites at the horse-flesh with his teeth, the blood streaming down from his mouth all the while he was eating... The third night Asmund became very drowsy, and the first thing he knew, Aran had got him by the ears and torn them off.